Alexios III Angelos (Greek: Αλέξιος Γ' Άγγελος) (c. 1153–1211) was Byzantine Emperor from March 1195 to July 17/18, 1203. A member of the extended imperial family, Alexios came to throne after deposing, blinding, and imprisoning his younger brother Isaac II Angelos. The most significant event of his reign was the attack of the Fourth Crusade on Constantinople in 1203, on behalf of Alexios IV Angelos. 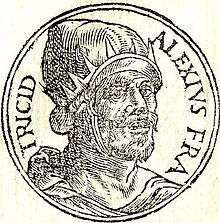 Alexios III took over the defense of the city, which he mismanaged, then fled the city at night with one of his three daughters. From Adrianople, and then Mosynopolis, he unsuccessfully attempted to rally his supporters, only to end up a captive of Marquis Boniface of Montferrat. He was ransomed, sent to Asia Minor where he plotted against his son-in-law Theodore Laskaris, but was eventually arrested and spent his last days confined to the Monastery of Hyakinthos in Nicaea, where he died. Alexios III Angelos was the second son of Andronikos Doukas Angelos and Euphrosyne Kastamonitissa. Andronikos was himself a son of Theodora Komnene Angelina, the youngest daughter of Emperor Alexios I Komnenos and Irene Doukaina. Thus Alexios Angelos was a member of the extended imperial family. Together with his father and brothers, Alexios had conspired against Emperor Andronikos I Komnenos (c. 1183), and thus he spent several years in exile in Muslim courts, including that of Saladin. His younger brother Isaac was threatened with execution under orders of Andronikos I, their first-cousin once-removed, on September 11, 1185. Isaac made a desperate attack on the imperial agents and killed their leader Stephen Hagiochristophorites. He then took refuge in the church of Hagia Sophia and from there appealed to the populace. His actions provoked a riot, which resulted in the deposition of Andronikos I and the proclamation of Isaac as Emperor. Alexios was now closer to the imperial throne than ever before. In the east the Empire was overrun by the Seljuk Turks; from the north, the Kingdom of Hungary and the rebellious Bulgarians and Vlachs descended unchecked to ravage the Balkan provinces of the Empire, sometimes penetrating as far as Greece, while Alexios squandered the public treasure on his palaces and gardens and attempted to deal with the crisis through diplomatic means. The Emperor's attempts to bolster the empire's defences by special concessions to pronoiars (notables) in the frontier zone backfired, as the latter increased their regional autonomy. Byzantine authority survived, but in a much weakened state. Alexios III attempted to escape Boniface's "protection" in 1205, seeking shelter with Michael I Komnenos Doukas, the ruler of Epirus. Captured by Boniface, Alexios and his retinue were sent to Montferrat before being brought back to Thessalonica in c. 1209. At that point the deposed emperor was ransomed by Michael I, who sent him to Asia Minor, where Alexios' son-in-law Theodore Laskaris - now emperor of Nicaea - was holding his own against the Latins. Here Alexios conspired against his son-in-law after the latter refused to recognize Alexios' authority, receiving the support of Kaykhusraw I, the sultan of Rûm. In the Battle of Antioch on the Meander in 1211, the sultan was defeated and killed, and Alexios was captured by Theodore Laskaris. Alexios was then confined to a monastery at Nicaea, where he died later in 1211. This article incorporates text from a publication now in the public domain: Bury, John Bagnell (1911). "Alexius III". In Chisholm, Hugh. Encyclopædia Britannica. 1 (11th ed.). Cambridge University Press.